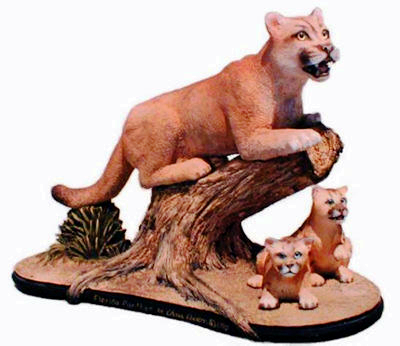 wildlife art sculpture 16 × 11 in. Endangered florida panther cats reflect on their domain among the palmettos and oak. This endangered wildlife species is of special concern as only 50 wild Florida Panthers remain alive. Please help them instead of me! 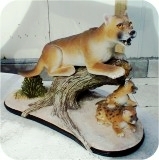 Also available as mountain lion den , panther cubs and black panther . The Florida panther is one of the (genus felis) purring cats, including the domestic cat. Protected since 1958, the Florida panther is one of the most endangered mammals, estimated at 30-50 individuals. They are a subspecies of the north American cougar (mountain lion, puma or catamount) They are usually loners, yet the kittens must stay with their mother for 18-22 weeks while they learn enough skills to survive on their own. Florida's official state animal is found principally in Everglades National Park and Big Cypress National Preserve. These lands provide the hunting range (as much as 20 miles per day) and deer population needed to support this large predator. Although Florida Panthers are carnivores, they have never attacked humans. Conservation groups are trying to release captive-reared cats into the wild. The Florida panther's survival depends on the survival of large, ecologically balanced parks and refuges, which provide lairs for these magnificent cats. Panther tracks are three inches in width; larger than the largest bobcat.